Carrot is a versatile vegetable used in cooking the options ranges from dry subzi, desserts and tasty beverages. 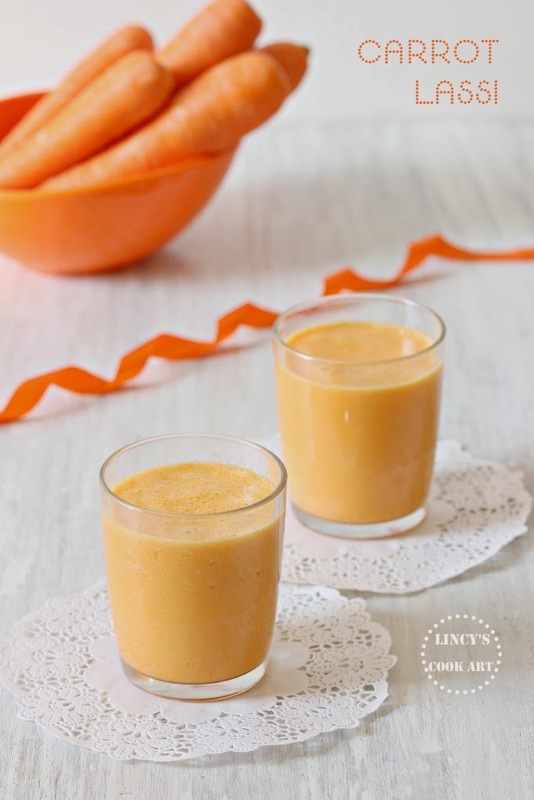 Earlier i have shared carrot milk shake recipe which is a delicious one perfect for breakfast. This beverage also can be consumed as breakfast or after food. Healthy as well as a tasty drink. Easy to make beverage with in minutes with the ingredients already available in your pantry in just a jiffy. You could strain the juice or you could prepare with the fiber too. Colourful delicious cool lassi to beat the summer heat. Cut the carrots roughly into smaller pieces. Add a piece of ginger if you like it. Now add the extracted carrot juice on a juicer or blender jar with the sugar/honey and yogurt/curd. Whip well till it becomes frothy. Serve chilled in glasses. Refreshing carrot lassi, so healthy and delicious too..